Goldsboro, NC Bojangles'® Tands, INC. Store #42 - Bojangles'® / Tands, Inc. If you’re craving Bojangles’® southern-style food — Cajun fried chicken, deliciously fresh biscuits and flavorful sides— you’re not alone! Goldsboro, NC loves the fast service and great flavors at Bojangles’®. This Bojangles’® is conveniently located in Goldsboro, NC just off of the exit ramp to Raleigh, adjacent to I-79. 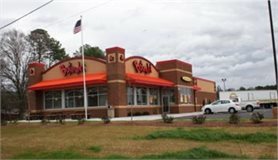 It’s one of the newer Bojangles locations in Goldsboro, NC! Both locals and those passing through love the bold flavors and affordable prices for the food at Bojangles’®.